In thanks to those who served both still here and already gone, here is to Memorial Day 2009. See you tomorrow. I find it especailly moving that you chose this photo. 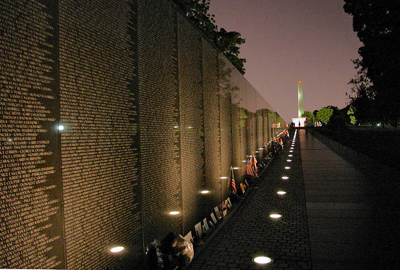 I have been to DC many times, and many times before this Memorial was built. The first time I saw it I thought I would just drop by and see the newest Memorial. It kicked the breath out of me and I spent hours trying to read every name. The enormity of the actual monument was honestly a shock. We hear the news and the numbers but when one sees each and every individual name chiseled out in order of death . . . it was life changing. Thank you to all who have served and all who have served and sacrificed so that I can sit in my little house and feel comfortable and safe and grateful. And may we please get this war over with and bring our men and women back home where they belong!